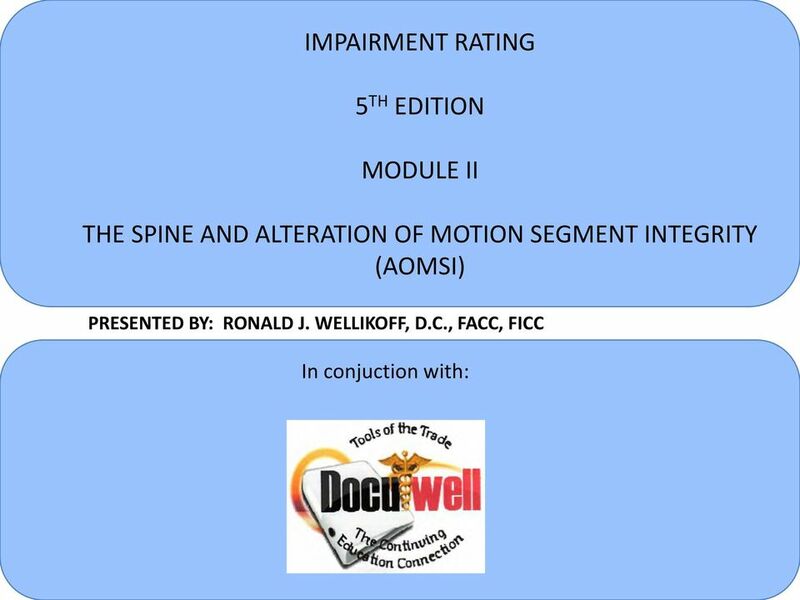 Download "IMPAIRMENT RATING 5 TH EDITION MODULE II"
3 5. The differentiators used in the 4 th edition are replaced by objective findings 6. 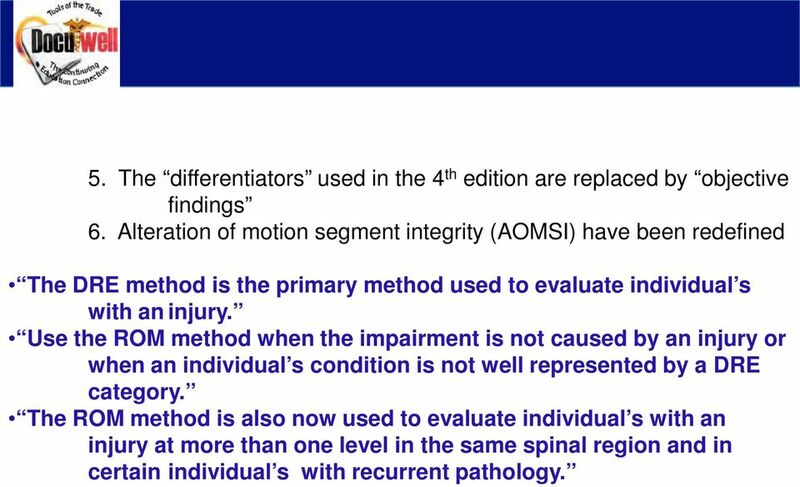 Alteration of motion segment integrity (AOMSI) have been redefined The DRE method is the primary method used to evaluate individual s with an injury. 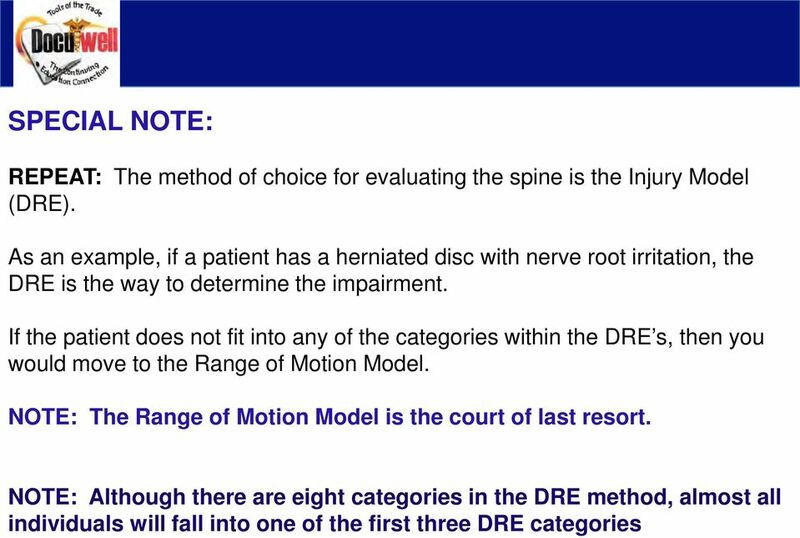 Use the ROM method when the impairment is not caused by an injury or when an individual s condition is not well represented by a DRE category. The ROM method is also now used to evaluate individual s with an injury at more than one level in the same spinal region and in certain individual s with recurrent pathology. 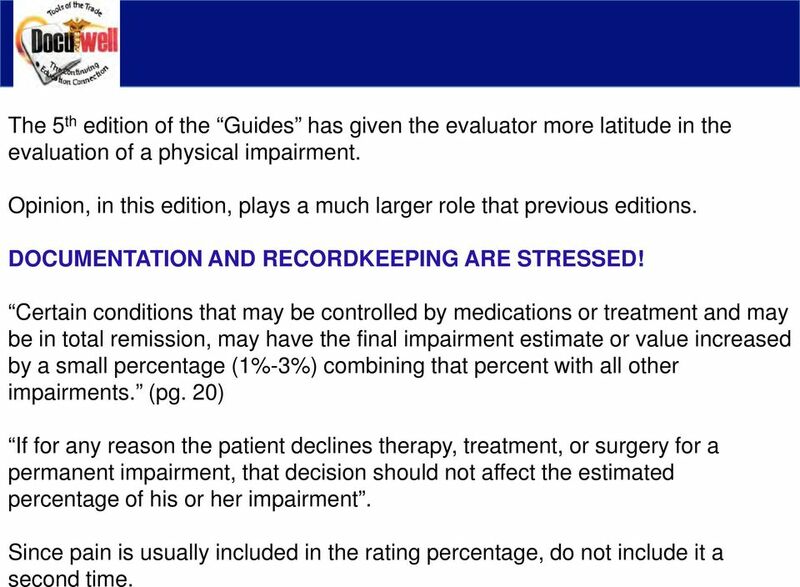 4 The 5 th edition of the Guides has given the evaluator more latitude in the evaluation of a physical impairment. Opinion, in this edition, plays a much larger role that previous editions. DOCUMENTATION AND RECORDKEEPING ARE STRESSED! Certain conditions that may be controlled by medications or treatment and may be in total remission, may have the final impairment estimate or value increased by a small percentage (1%-3%) combining that percent with all other impairments. (pg. 20) If for any reason the patient declines therapy, treatment, or surgery for a permanent impairment, that decision should not affect the estimated percentage of his or her impairment. Since pain is usually included in the rating percentage, do not include it a second time. 5 Diagnostic tests such as x-rays, MRI s, CT s, etc. should only be done if necessary and relevant. 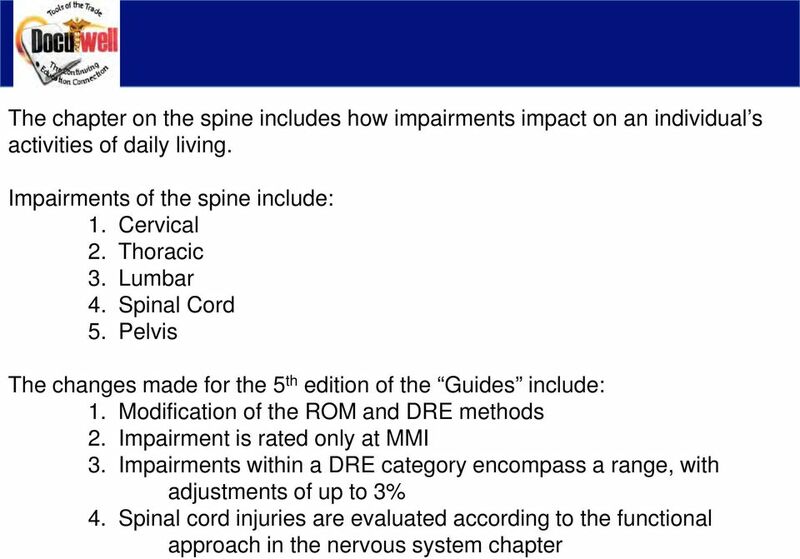 The 5 th edition of the Guides continues to use two methods to evaluate spinal impairments: 1. 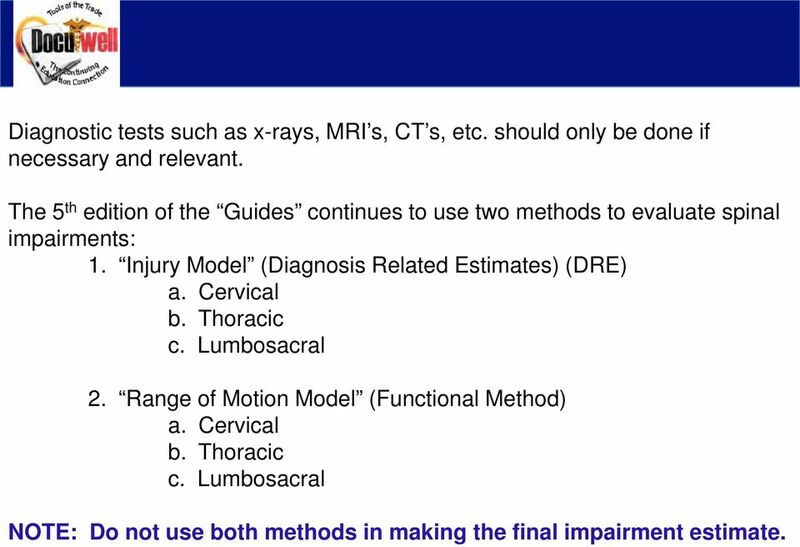 Injury Model (Diagnosis Related Estimates) (DRE) a. Cervical b. Thoracic c. Lumbosacral 2. Range of Motion Model (Functional Method) a. Cervical b. Thoracic c. Lumbosacral NOTE: Do not use both methods in making the final impairment estimate. 8 Definition of Clinical Findings: 1. Muscle Spasm 2. Muscle Guarding 3. Asymmetry of Spinal Motion 4. Nonverifiable Radicular Root Pain 5. Reflexes 6. Weakness and Loss of Sensation 7. Atrophy 8. Radiculopathy 9. Electrodiagnostic Verification of Radiculopathy 10. Alteration of Motion Segment Integrity 11. Cauda Equina Syndrome 12. Urodynamic Tests IF, a patient cannot be assigned to a DRE category, look to Range of Motion. 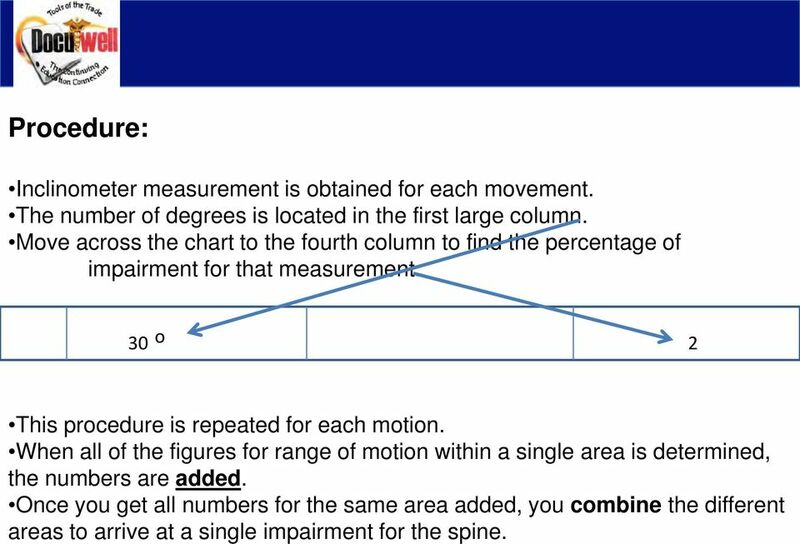 With the Range of Motion Model, use impairment values in the Spinal Disorders table (15-7), and combine them with values obtained from the patient s range of motion, neurological deficits, and values from the other organ systems involved. 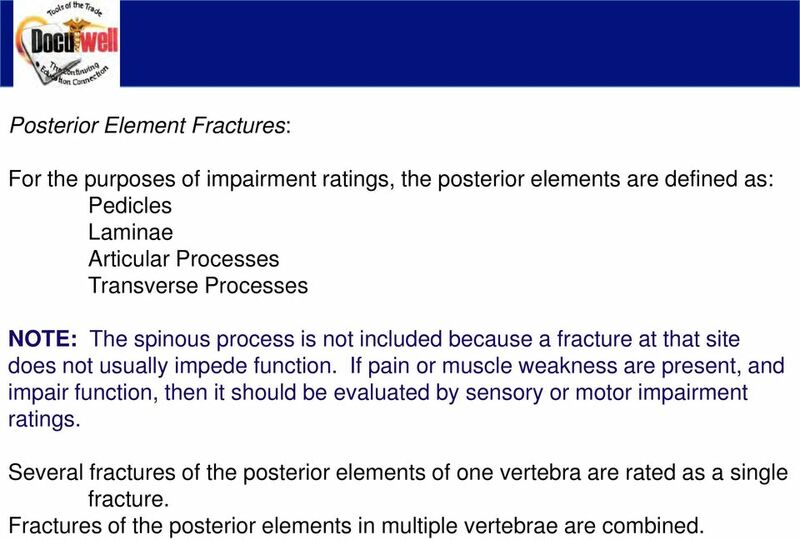 12 Posterior Element Fractures: For the purposes of impairment ratings, the posterior elements are defined as: Pedicles Laminae Articular Processes Transverse Processes NOTE: The spinous process is not included because a fracture at that site does not usually impede function. If pain or muscle weakness are present, and impair function, then it should be evaluated by sensory or motor impairment ratings. Several fractures of the posterior elements of one vertebra are rated as a single fracture. Fractures of the posterior elements in multiple vertebrae are combined. 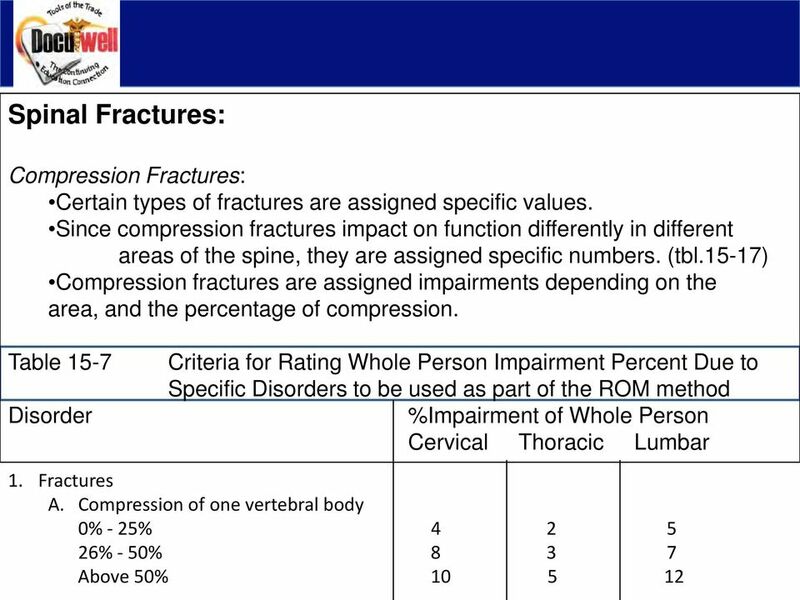 13 Spinal Fractures: Posterior Element Fractures: Table 15-7 Disorder Criteria for Rating Whole Person Impairment Percent Due to Specific Disorders to be used as part of the ROM method %Impairment of Whole Person Cervical Thoracic Lumbar 1. 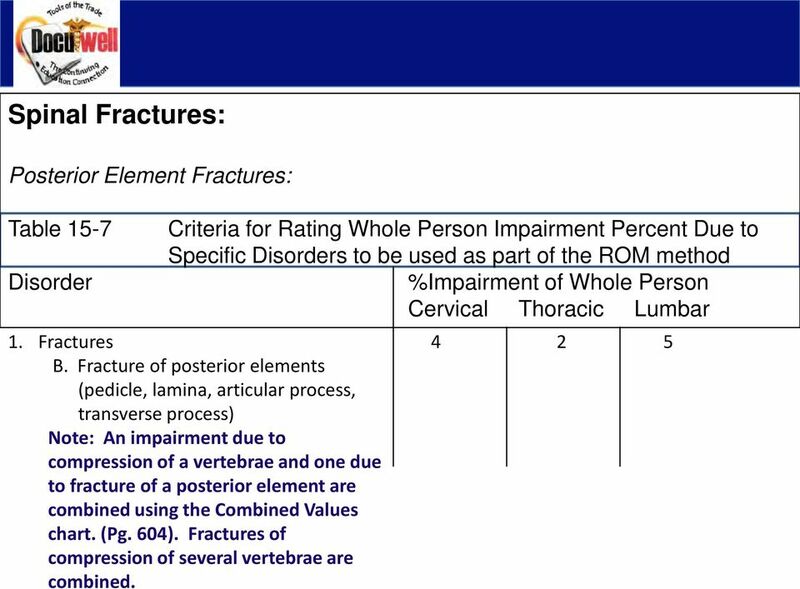 Fractures B. Fracture of posterior elements (pedicle, lamina, articular process, transverse process) Note: An impairment due to compression of a vertebrae and one due to fracture of a posterior element are combined using the Combined Values chart. (Pg. 604). Fractures of compression of several vertebrae are combined. 15 Spinal Measurement: Although the goniometer has been used for spinal measurement, it is no longer being used. 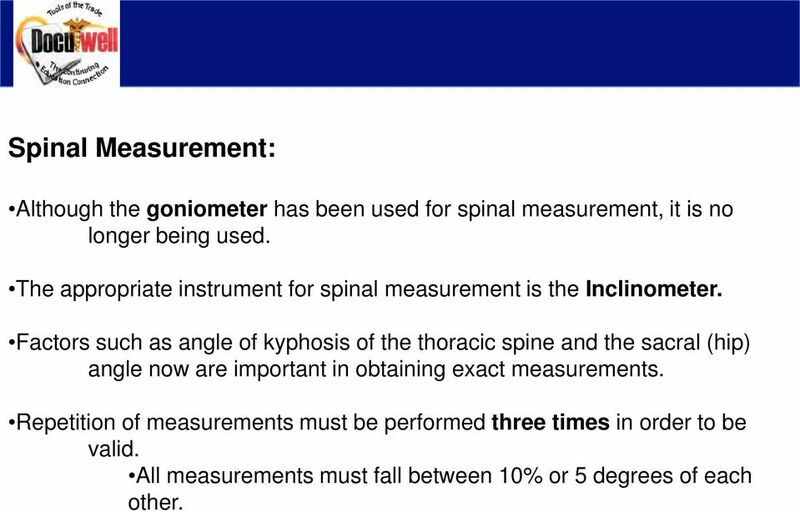 The appropriate instrument for spinal measurement is the Inclinometer. Factors such as angle of kyphosis of the thoracic spine and the sacral (hip) angle now are important in obtaining exact measurements. Repetition of measurements must be performed three times in order to be valid. All measurements must fall between 10% or 5 degrees of each other. 16 Using the Inclinometer: The inclinometer is used for each plane of movement in the spine. NOTE: Calculate the mean or average of the three. If the average is less than 50 degree, three consecutive measurements must fall within 5 degrees of the mean: if the average is greater than 50 degrees, three consecutive measurements must fall within 10% of the mean. (pg. 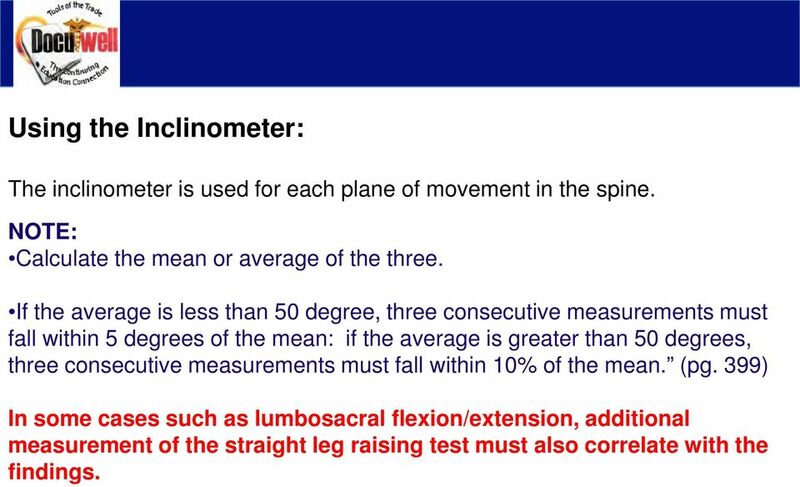 399) In some cases such as lumbosacral flexion/extension, additional measurement of the straight leg raising test must also correlate with the findings. 17 Procedure: Inclinometer measurement is obtained for each movement. The number of degrees is located in the first large column. Move across the chart to the fourth column to find the percentage of impairment for that measurement. 30 o This procedure is repeated for each motion. When all of the figures for range of motion within a single area is determined, the numbers are added. Once you get all numbers for the same area added, you combine the different areas to arrive at a single impairment for the spine. 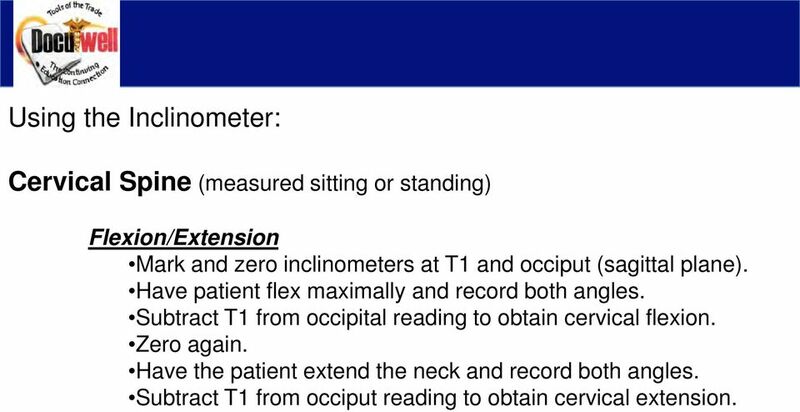 18 Using the Inclinometer: Cervical Spine (measured sitting or standing) Flexion/Extension Mark and zero inclinometers at T1 and occiput (sagittal plane). Have patient flex maximally and record both angles. Subtract T1 from occipital reading to obtain cervical flexion. Zero again. Have the patient extend the neck and record both angles. Subtract T1 from occiput reading to obtain cervical extension. 19 The subject is either sitting or standing with the head in the neutral position, with inclinometers over the occiput and T1. With the subject in full flexion position, subtract the angle at the lower inclinometer from the upper inclinometer to obtain the cervical flexion angle. Subtract the T1 inclinometer angle from the occipital angle to obtain the extension angle. Alternative placement of lower inclinometer when extension motion is so great as to displace inclinometer over T1. Use skin mark for placement over the scapualr spine. 20 Lateral Flexion Mark and zero inclinometer at T1 and occiput (coronal plane). Have patient laterally flex to the left and record both angles. 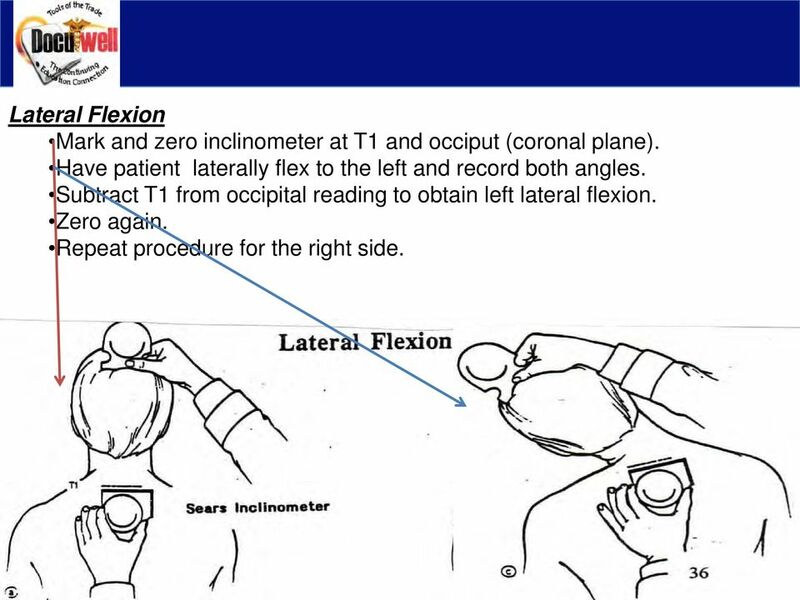 Subtract T1 from occipital reading to obtain left lateral flexion. Zero again. Repeat procedure for the right side. 21 Rotation (Patient in reclined supine position use one inclinometer) Place the inclinometer near the back of the head in line with the cervico-occipital junction. Zero out with patient s nose pointing toward the ceiling. Patient rotates head to right and record angle of rotation. Zero again. Patient rotates head to the left and record angle of rotation. Add values for total rotation. 26 Ankylosis: Ankylosis is defined as the complete absence of joint motion or as a fixed position. Although ankylosis is rare in the spine, those patients who cannot reach the neutral or 0 degree position, the position or angle of restriction closest to the neutral position is considered to be the position of ankylosis. If a region has several range of motion impairments, and an ankylosis impairment, the range of motion impairments are added and the total is combined with the ankylosis impairment. The examiner should add the ankylosis impairments in several planes within a single region and then combine with ankylosis impairment of two or more regions. 27 Example: An individual who can flex the cervical region from 30 degrees to 50 degrees and who lacks 30 degrees of motion in reaching the neutral 0 degrees position has the same estimated impairment as if he or she had ankylosis at 30 degrees of cervical flexion. According to table 15-12, the patient s impairment is 30% of the whole person. 28 Thoracic Spine (may be measured sitting or standing) Flexion/Extension Note: Flexion and extension is relatively limited with a degree of extension significantly determined by the subject s posture and the degree of fixed kyphosis. Subject is measured in a military brace posture to obtain angle of minimum kyphosis (found in ankylosis section of table 79). Following this, the angle of thoracic flexion is obtained by flexing the thoracic spine. 1. Zero inclinometers against a true vertical surface such as a wall. 2. Mark T1 and T12 and read the inclinometers in military brace position. 3. Subtract T12 from T1 to get angle of minimum kyphosis. 4. Zero again. 5. Patient then flexes and the T1 and T12 angles are recorded. 6. Subtract T12 from T1 to obtain the angle of Thoracic Flexion. 29 THORACIC SPINE 2 inclinometer measurement technique for obtaining angle of minimum kyphosis. Standing & Sitting Techniques With the inclinometer at T1 and T12 and with the subject in the erect military brace posture to obtain angle of minimum kyphosis. With the inclinometer over T1 and T12 and with thoracic spine maximally flexed to obtain angle of thoracic flexion. 31 Rotation (measure patient in a flexed position) 1. Mark T1 and T12 points (neutral position to zero out). 2. Have patient maximally rotate to the right and record values. 3. Subtract T12 from T1 to obtain thoracic right Rotation. 4. Repeat procedure for left rotation. 33 Lumbosacral Spine (measure standing) Note: Lumbar flexion is a compound movement of the lumbar spine and hips (measured at the sacrum). Hip flexion actually accounts for 50% of total flexion. A comparison of hip flexion to straight leg raising on the tightest side offers a validation measure independent of reproducibility. The test is invalid and must be repeated if the following validity criterion is not met. Tightest straight leg raising (SLR) (hip flexion + hip extension) is within plus or minus 15 degrees. 1. Zero inclinometers over T12 and sacrum. 2. Subject flexes maximally and both angles are recorded. 3. Subtract sacral (hip) measurements from T12 measurement for true lumbar flexion angle. 4. Zero again. 5. Subject extends trunk and both angles are recorded. 6. Subtract sacral (hip) angle from T12 angle and record true lumbar extension angle. 7. Record straight leg raising (SLR) angle and compare to sacral hip motion (flexion + extension). Test must be less then 10 degrees to be valid. 36 Lateral Flexion 1. Zero out inclinometers over T12 and sacrum in coronal plane. 2. Patient lateral flexes to right and both angles are recorded. 3. Subtract sacral (hip) inclination from T12 for right Lateral Flexion angle. 4. Zero again. 5. Repeat procedure to the left. 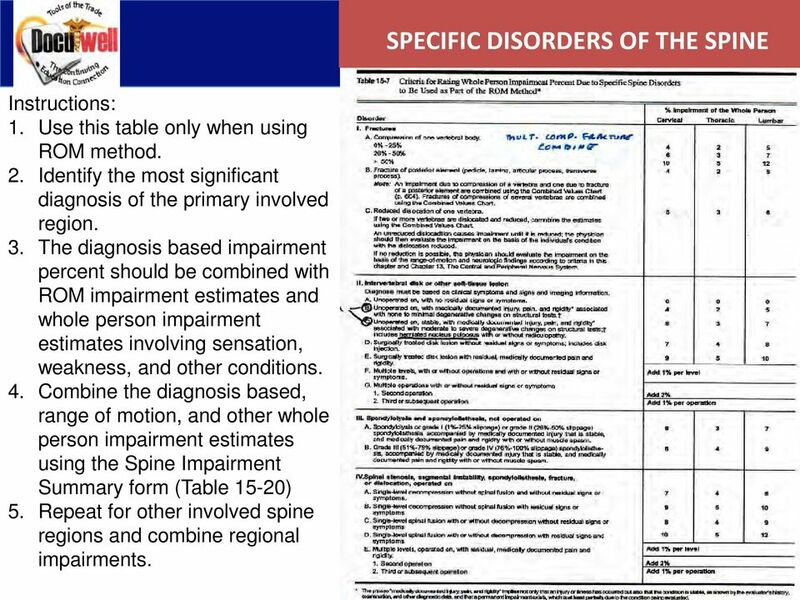 38 DIAGNOSIS RELATED ESTIMATES (DRE) Within this method of rating, there are eight diagnosis related categories. The two methods of assigning a rating are: 1. Based on symptoms, signs, and appropriate diagnostic test results. 2. 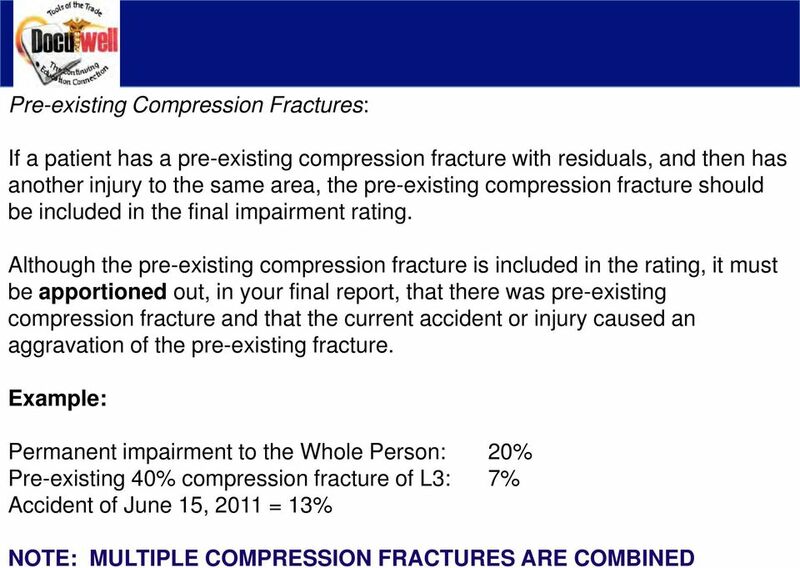 Based on the presence fractures and/or dislocations with or without clinical symptoms. While there are eight categories listed in the DRE s, for the most part, we will be addressing categories I, II, III. Categories IV and V address Alteration of Motion Segment Integrity and Fractures. 44 Example: A patient had a radiculopathy caused by a herniated disc that responded to conservative care and currently has no radicular symptoms or signs, That individual would be placed in Category II. If, however, that same patient had the same findings (HNP) with a radiculopathy then they would be placed in Category III. 47 EXAMPLE: CERVICAL SPINE DRE Subject: 37 year old female History: Pain in the neck and lateral right upper extremity extending to the thumb following a rear end collision. An MRI showed a herniated disc at C6. She elected nonoperative treatment and recovered after 18 months. Current Symptoms: Some residual neck pain with physical activity; upper limb symptoms have resolved. Physical Exam: Slight loss of motion of the cervical spine. Neurologic examination is normal. Clinical Studies: Initial MRI: right posterolateral disc herniation at C5. No additional imaging studies were performed. Diagnosis: Herniated disc C5-6 with resolved right C6 radiculopathy. Impairment Rating: 5% WP Comment: The individual qualifies for DRE cervical category II beacause she had a radiculopathy caused by a herniated disc that responded to treatment. She has no significant residual signs. 50 EXAMPLE: THORACIC SPINE DRE Comment: This individual qualifies for DRE thoracic category V because he has mild right lower extremity neurologic deficits (category III) and alteration of motion segment integrity given fusion (category IV). A combination of categories III and IV in the thoracic region means that the individual qualifies for category V. NOTE: Because he has alteration of motion segment integrity of more than one level (multilevel fusion), he could also be rated by the ROM method. The best approach would be to rate the individual by both methods and award the higher rating. 52 EXAMPLE: LUMBAR SPINE DRE Subject: 25 year old man History: Onset of back and left leg pain after a fall on a concrete surface while carrying a box. Initially presented with muscle spasm, an SLR on the left side at 60 degrees, a positive crossed SLR at 70 degrees, and an absent left Achilles tendon reflex. Treated with physical therapy but did not improve. Underwent surgical discectomy and arthodesis of L5-S1 three months after the injury. After 9 months of rehabilitation, leg and back symptoms were diminished but present. Current Symptoms: Back and thigh pain at rest and persistent numbness along the lateral side of the foot 1 year after the onset of symptoms. Pain and numbness prevent individual from maintaining a constant position, prolonged standing or walking, or performing his prior work, recreational, and some household activities. Physical Exam: Severely restricted range of motion. Loss of the Achilles reflex. Numbness in the S1 nerve root distribution and dermatomal pain I the leg on SLR. 53 Clinical Studies: Original MRI: a severely degenerated L5-S1 disc with a herniation on the left side. Post-operative MRI with gadolinium: fibrosis, but no residual or recurrent herniation. Fusion appears solid. Diagnosis: Left posterolateral disc herniation L5-S1 with S1 radiculopathy and severe disc degeneration, unresolved status post-discectomy and L5-S1 fusion. Impairment Rating: 28% WP Comment: Symptoms, physical findings, and imaging studies are all consistent with a symptomatic herniated disc. Excision of he offending disc and a single level fusion did not relieve all symptoms, which are supported by signs of a persistent radiculopathy. 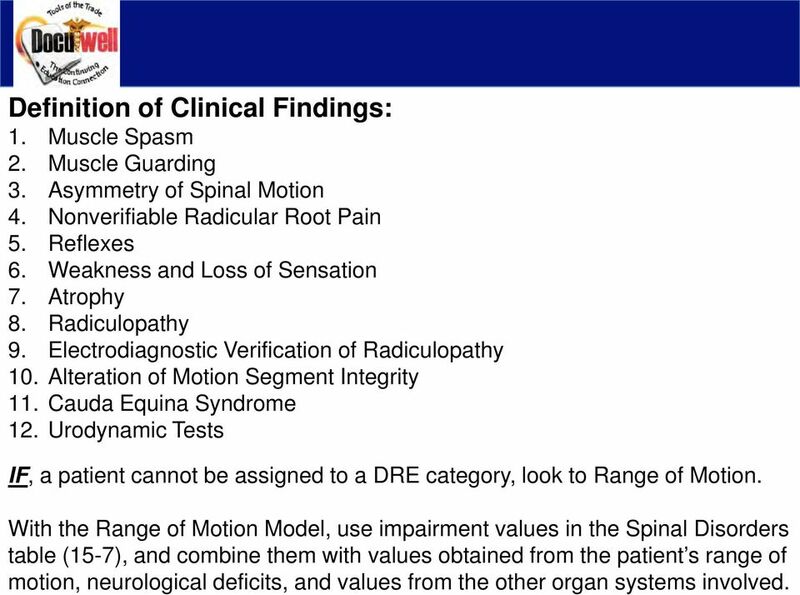 Individual qualifies for lumbar DRE category V because he has persistent radiculopathy as well as single level alteration of motion segment integrity. 62 AOMSI The purpose of our discussion, regarding AOMSI, is not to make you into a radiologist. In fact, it is my opinion that a referral to a chiropractic radiologist would make the most sense when using this method. Remember, you have to defend your opinion! 64 AOMSI as described in the Guides is assessed by plain film flexion-extension radiographs ONLY. Source to image distance (SID) for flexion-extension x-rays of the thoracic and lumbar spine is not defined in the literature or medical practice; however, 40 SID imaging parameters are most commonly used in the lumbar spine. If a diagnosis of AOMSI, pseudoarthrosis, fracture, or spondylolisthesis is made, imaging studies should be excluded as a grade modifier. 65 With an understanding that we are not radiologists, the following are some of the figures described in the 6 th Edition of the Guides: Cervical Spine: A diagnosis of AOMSI in the cervical spine by translation measurements requires greater than 20% anterior or posterior relative translation of one vertebra on another or angular motion of more than 11 degrees greater than each adjacent level on the flexion x-ray. Thoracic Spine: A diagnosis of AOMSI in the thoracic spine by translation measurements requires at least 2.5 mm anterior or posterior translation of one vertebra on another. 66 Lumbar Spine: A diagnosis of AOMSI in the lumbar spine by translation measurements requires greater than 8% anterior or 9% posterior relative translation of one vertebra on another. Lumbosacral Spine: A diagnosis of AOMSI in the lumbosacral spine by translation measurements requires greater than 6% anterior or greater than 9% posterior relative translation at L5-S1 of L5 on S1. NOTE: The identification of degenerative disk disease at one or multiple levels, similar to the finding of arthrosis in an extremity joint, is not diagnostic of an injury, or disease, related pathology because such degenertative changes can be a natural consequence of the aging process. TWO CONTRASTING CASES OF SCIATIC RADICULOPATHY: ONE WITH NORMAL MRI AND ONE WITH A FREE FRAGMENT. WHAT S A CHIROPRACTOR TO DO? Cervical Spondylotic Myelopathy Associated with Kyphosis or Sagittal Sigmoid Alignment: Outcome after Anterior or Posterior Decompression 1 Journal of Neurosurgery: Spine November 2009, Volume 11, pp. Vertebral anatomy study guide. Human Structure Summer 2015. Prepared by Daniel Schmitt, Angel Zeininger, and Karyne Rabey. Spinal Anatomy. * MedX research contends that the lumbar region really starts at T-11, based upon the attributes of the vertebra. Anatomy of the Spine. Figure 1. (left) The spine has three natural curves that form an S-shape; strong muscles keep our spine in alignment. OVERVIEW. 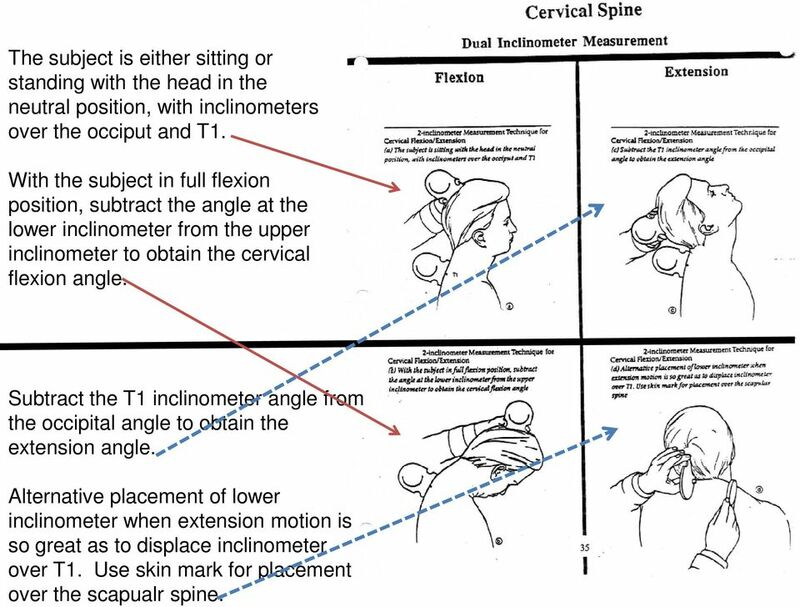 NEUROSURGICAL ASSESSMENT CERVICAL PROBLEMS Dirk G. Franzen, M.D. WHAT IS THE MOST IMPORTANT PART OF THE PHYSICAL EXAM?